Learning how to cut in is a key skill every DIY decorator should have. The area where your walls meet the ceiling is a tricky place to paint, and if you don't take your time to do it properly you could end up with a pretty dodgy looking paint job. 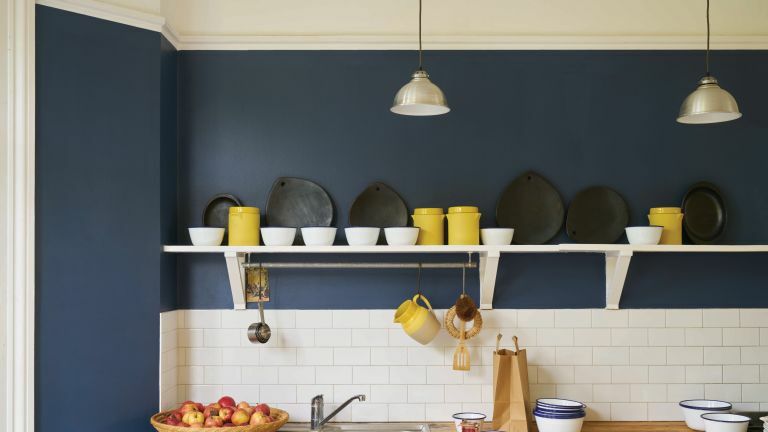 We want to see crisp, clean, clear edges all along the top of the walls and to get that perfect finish you need to cut in with a paintbrush when painting a wall or ceiling. It really isn't that hard, and with a little practise and a good brush, you will be a pro in no time. Need more advice on painting? You'll find everything you could ever need in our guide to how to paint rooms and walls. There are plenty more tips, tricks and inspiration over in our decorating hub, too. Which brush should I use for cutting in? A good brush for cutting in is essential. A number of products are labelled as 'cutting-in brushes' and may have tapered bristles or a slanted end to help get that pleasing clean line. However, any good-quality 2" brush, which won't shed bristles, is a sound choice. Don't go too narrow as you need to be able to paint far enough from the edge to roller in (without scuffing the adjoining wall). If you are looking to learn how to cut in, we are going to assume you are painting at least one wall, so make sure you move away anything that could suffer from paint splatters. Also cover any light switches and plug sockets that could face the same fate, and cover the floor and larger pieces of furniture in plastic sheets. It's advisable to paint the ceiling before the walls as it's a slightly trickier task and you are more likely to make errors that can be cleaned up later when you start painting the walls. Wait until the ceiling paint has dried before you start painting the walls as to cut in you will need to apply tape to the ceiling. Wet paint and masking tape? Not a good idea. Browse our specialist feature if you're looking for step-by-step instructions on how to paint a ceiling. Unless you’re confident that you have a very steady hand, it’s best to use frog tape to tape off the areas where the ceiling meets the wall to ensure you get clean lines. To do this start by places a strip of tape in the corner of the ceiling, right where the ceiling meets the wall. Press down on it firmly until it lies flat against the ceiling. Then slowly drag the tape along the length of the ceiling in a straight line, flattening it as you go. If you are doing the entire room as apposed to one feature wall, repeat until the whole ceiling has a ring of tape around it. Top tip: Make sure there are no air pockets, otherwise you run the risk of paint seeping through onto the ceiling. Pour some paint into a small paint tray – you don’t need much at this stage. Dip your brush straight down into the paint, until the paint covers roughly a third of the bristles. Then gently tap each side of the brush against the side of the paint container to avoid any drips. Holding the brush with a pencil grip for control, make a brushstroke on the wall about two inches away from the edge you’re cutting in, to remove the excess paint. This should be about 12 inches long. Then turn the brush so that you’re using the narrow edge and paint your downward stroke up to 12 inches long right next to the Frog tape. Top tip: Make sure you don’t apply too much pressure as the paint ooze from the brush and create drips. After you have finished cutting in, continue to paint the rest of the room with a paint roller. Just make sure you reach as high as your initial 1–2" strip of wall paint. Do not push or drag the roller all the way up to the ceiling. Once the paint is dry you can remove the tape and voila, nice clean edges. Looking for more painting and decorating advice?